The station is situated 3 miles E.N.E. of Pembroke Docks on the N. side of the junction of the Cresswell and Carew rivers with Dancleddan the northerly extension of Milford Haven. One, width 18 feet, leading to hanger apron. Hauling out by hand. Aviation .............. Capacity 4,800 gallons. The Royal Naval established seaplane facilities here in the spring of 1941 to train Fleet Air Arm pilots in the art of flying seaplanes. Operations began in May 1941 when Walrus and Swordfish aircraft from No. 764 Seaplane training Squadron, based at RN Air Section RAF Pembroke Dock, began using the site and nearby practice bombing ranges. By October 1941 the Air Section was withdrawn in response to enemy air raids on Pembroke Docks and relocated, with 764 squadron, to the Lawrenny Ferry site. Lt. Cdr (P) H. Wright RN, was appointed as Officer in Charge of the new station and new commanding officer of 764 squadron on October 17th. This became a Royal Naval Air Station under the control of HMS DAEDALUS at Lee-on-Solent. From this time the official role of the station was Seaplane Flying Training Part II, and included Seaplane conversion and sir gunnery courses. 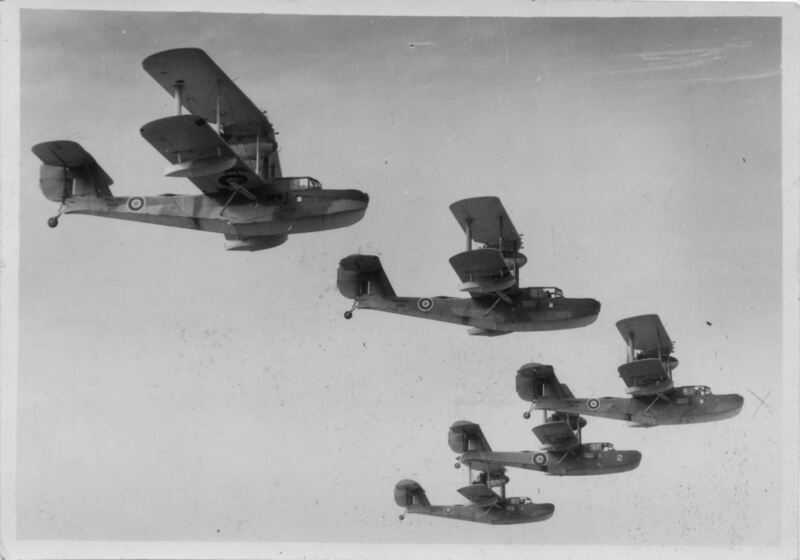 The squadron moved in with 8 Walrus and 1 Swordfish floatplane, but this was withdrawn soon after the move and the Walrus was the main equipment until the middle of 1942 when Sikorsky Kingfishers arrived. 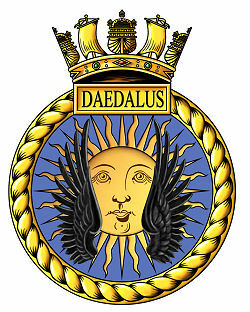 The station was commissioned as HMS DAEDALUS II1 on February 1st 1942 but later reverted to having its accounts borne 'on the books of Daedalus'. The Air station comprised of one 60' by 70' hangar, three concrete hardstandings for the ground handling of seaplanes, a wooden jetty and an 18-foot-wide concrete slipway for manually hauling out aircraft. Accommodation and administration offices were provided within local cottages and Nissen huts; other accommodation was found in the village of Lawrenny, the Lawrenny Arms acted as the NCOs' mess and two steam yachts, CARMELA and ZAZA were used for accommodation of 764 squadron personnel, these had moved up river from Pembroke Dock and were moored there at Lawrenny Quay. Aircraft were moored in the river Daugleddau between Lawrenny Quay and Coedcanlas further upstream. A practice bombing range was established at Sprinkle Pill, 3 miles North on the Cleddau river, with range observer situated on the Eastern bank near Landshipping. 764 squadron had operated of a maximum of 12 Walrus amphibians and 6 Kingfisher floatplanes; many as 33 Walrus passed through the unit during the period May 1941 - October 1943, compared with only a maximum of 8 Kingfishers. The larger, American, Kingfisher floatplanes were only received in small numbers, the first arrived in July of 1942, and a second joined the squadron in October and a third in February 1943. This number rose to six in March 1943 but this was short lived; two were written off in March; FN688 caught in a downdraught, and crashed on touchdown and FN694 undershot, hit a rock & capsized. Two more crashed in April, FN680 capsized on start-up and FN689 capsized in a crosswind and a strong tide while starting up at its mooring buoy. As a result of these accidents only one Kingfisher remained operational during May through August when FN701 arrived. Attrition amongst the Walrus complement was also fairly high, 3 aircraft suffered accidents resulting in category X, repairable on site, damage; K8340 grounded on slipway in July 1942, L2234 ran aground taxying down Cleddau River after night flying on very dark night in February 1943, and W2704 swerved on landing and its port wing touched down in April 1943.3 suffered Category Y damage, repairable but at a repair yard; R6546 Ran into a derelict jetty, in August 1942, K8340 aircrew got lost, and made forced landing striking a hedge in September 1942, and W2718 rammed into a yacht while embarking passengers from a motor dinghy in May 1943. 4 aircraft were written off in category Z incidents, two involving fatalities; L2230 was left to sink after its crew landed in minefield to rescue the crew of Sunderland DV972 of 119 Sqn RAF in November 1942, but failed to take off - all rescued by launch. W3079 crashed into trees during a night landing in November 1942. W3031 capsized in the Cleddau River after its Starboard wingtip hit on landing in August 1943, Midshipman BG Bridgewater was killed but Sub Lt. FW Smallwood was rescued. On August 27th 1943 the wing of Walrus P5707struck a pinnace and the aircraft dived into the water, Lt. Cdr. RLM Shannon was uninjured but a 14 year old Sea cadet, Alec Hancock was killed "due to war operations" - presumably he was in the pinnace. On June 1rth 1943 Lt. Cdr (A) J.E. Mansfield RNVR was appointed as Commanding Officer of the station, and Lt. Cdr (A) J.O.B Young RN arrived to take over 764 squadron, By this time the need for dedicated Seaplane Training schools had passed and both the station and it's squadron were to be closed by the end of the year. The station reduced to Care and Maintenance status on October 21st on three months’ notice to resume flying, 764 Squadron was officially disbanded on November 7th 1943. No further use was made of the base and it was closed sometime in late 1945. 1 Reference to 'DAEDALUS II' is probably spurious; the name has been linked to Sandbanks, Lawrenny Ferry, Lympne, and Newcastle-under-Lyme. Only one Training establishment bore this name RNATE Lympne/Newcastle-under-Lyme commissioned 01.01.40, paid off 31.01.46. Lawrenny Ferry is listed as RNAS under Western Approaches Command on books of 'Daedalus' for accounts in the February 1942 edition of the Navy List. Alice Pyper & Marion Page. 2012. TWENTIETH CENTURY MILITARY SITES: AIRFIELDS. [ONLINE] Available at: http://www.dyfedarchaeology.org.uk/projects/military20thc.pdf. [Accessed 01 December 13].